Eastern Delights is an online slots game by developer Playson. It is a Middle-Eastern themed game with unique features and fun graphics. The game consists of several bonuses like Free Spins, Wilds, and Multipliers. The best, however, has to be the Symbol Drop feature. This is valid both in the base game and bonus feature and essentially works like a photocopying service. It duplicates the symbols directly above it to increase the chances of forming a winning combination. Eastern Delights looks beautiful and vibrant with its design. The backdrop shows a traditional tented area with flickering flames on either side. The clothes frame the game board wonderfully while the surrounding plants add a touch of colour to the ambience. There is an elderly gentleman in a turban by the corner of the reels who provides some intense eye contact. The symbols in the game are of Middle Eastern style: Exotic Fruits, Drinks, Peacocks, and Delicious Sweets. This online slots game offers traditional bonuses and features like the Wild and Scatter. Though the more interesting one has to be the Symbol Drop Feature. It rids of all symbols in a winning combination and makes duplicates the symbols directly above the wins to increase the possibility of forming yet another winning combination. Below is an outline of Eastern Delights bonus features and rounds. 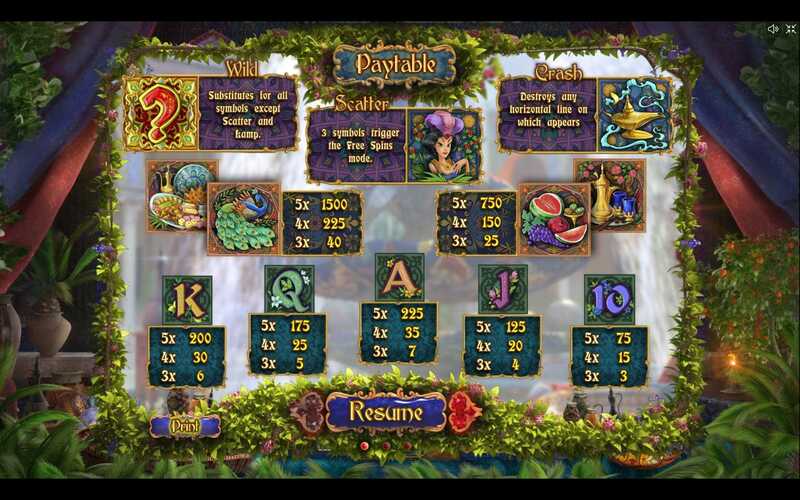 The Question Mark serves as the Wild symbol in this online slots game. The Wild can replace any symbol in the game with the exception of the Scatter and Lamp. The Arabian Princess represents the Scatter in Eastern Delights. If you land 3 or more Scatters, you will trigger the Free Spins bonus round. In this feature, all the symbols in a pay line that have formed a winning combination disappear and are replaced by the symbols that are above them. If this new arrangement creates another win then gamers are awarded an extra Free Spin. You can reach up to 3 extra Free Spins in total with this feature. The lamp symbol will appear only on reel 5 during the Free Spins Round. It eviscerates the line it appears on (horizontally) to make room for Symbol Drops (above). If you are delightful enough, you can win up to 50 extra Free Spins with this feature. Eastern Delights brings to players an indulgent lifestyle of the East. It is visually beautiful, offers good bonuses, and it is easy to navigate. A great game slots game with a great set up!